The company takes pride in their role as partners of modern women and mothers in providing families healthy, safe and stylish dining, cooking and baking experiences. I can attest to that! In line with their thrust, I’m happy to announce that this summer, Corelle has launched something special for Pinay mommies in the metro as they open their search for CORELLE’s Women of Health and Style. Attach a solo picture of herself and a picture of her family using at least one of the brands: Corelle, Corningware, Pyrex, Visions, Snapware. 2. Search is open to Modern Filipina Moms in Metro Manila only. 3. Candidate must be 25-35 years old, married, and user of the brand/s: Corelle, Corningware, Pyrex, Visions and Snapware. 4. Submission of entries is from March 21 to April 20, 2014. 5. Six (6) winners will be chosen by World Kitchen Asia Pacific and Raffles and Company, Inc.
6. Finalists will also be voted on via Facebook for a chance to win. 7. Formal awarding will be announced this May 2014. 3. Winners will also enjoy more perks and prestige of being Corelle’s Women of Health and Style. 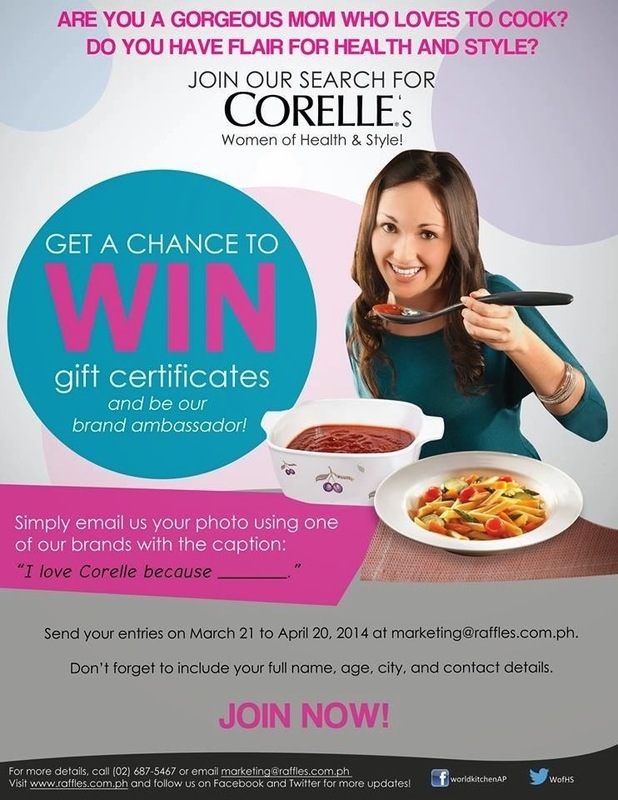 Mommies, JOIN NOW and be one of CORELLE’s first brand ambassadors! Invite your friends to join too, if you know they embody the modern Filipina mom. Let them inspire a healthy and stylish change, and celebrate women and their achievements as CORELLE’s Women of Health and Style. For more details, call (02) 687-5467 or email marketing@raffles.com.ph. Visit www.raffles.com.ph and follow them on Facebook and Twitter for more updates! Corelle, Corningware, Pyrex, Visions and Snapware are exclusively distributed in the Philippines by Raffles and Company, Inc. via authorized dealers, independent distributors and leading department stores nationwide. Visit the brand showroom at Kitchen World, 3F Eastwood Mall.